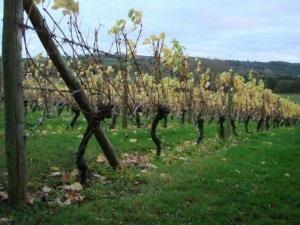 Frome Valley Vineyard01885 490768work VineyardWine has been produced in Herefordshire since Medieval times. Frome Valley Vineyard at Paunton Court are very happy to maintain this tradition. Frome Valley Vineyard vines are grown on a gentle south facing slope in idyllic English countryside. The grapes are lovingly tended to take full advantage of the best of the sunshine and are picked at the peak of their condition. The vineyard produce a range of white wines to suit all tastes from dry to medium sweet. They are light and fruity, and should be drunk slightly chilled. They are ideal as an aperitif or as an accompaniment to fish or white meat. Surrounded by Herefordshire’s hopyards and cider orchards, Frome Valley Vineyard grow white and red grapes in four acres of vineyard. Taste their wines and tour the vineyard.